If you buy one sweater this winter, it better be this one. I have already snagged in white, grey and I've got my eye on the navy, It's perfect on its own or layered as seen above with a great oversized flannel shirt. I haven't tried it with a skirt quite yet but I'm thinking of pairing it with a great leather pencil for a more casual vibe at the office. How would you style it?! Perfectly styled outfit! Love your bag and hat! I love the turtleneck and plaid shirt combo! My favorite way to layer. 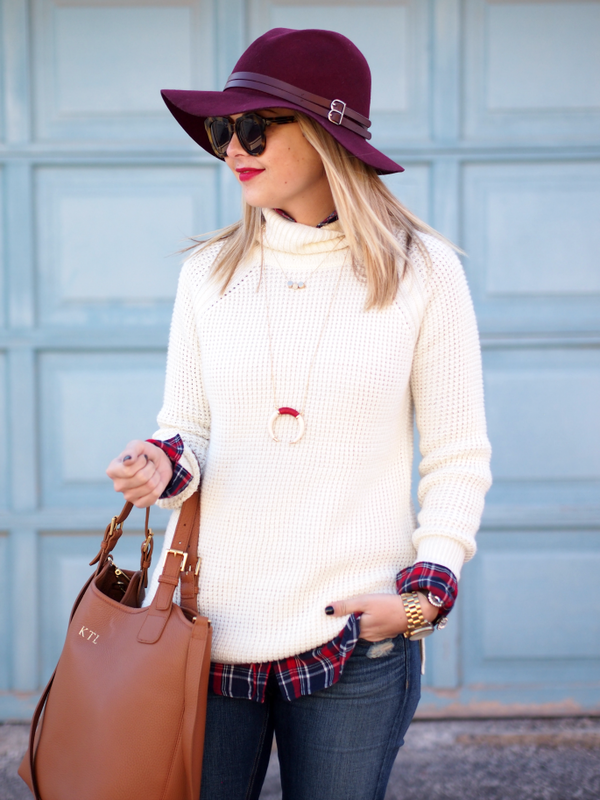 Love the cozy sweater with just the right amount of plaid sticking out! And that hat is the perfect color! I'm loving this look! 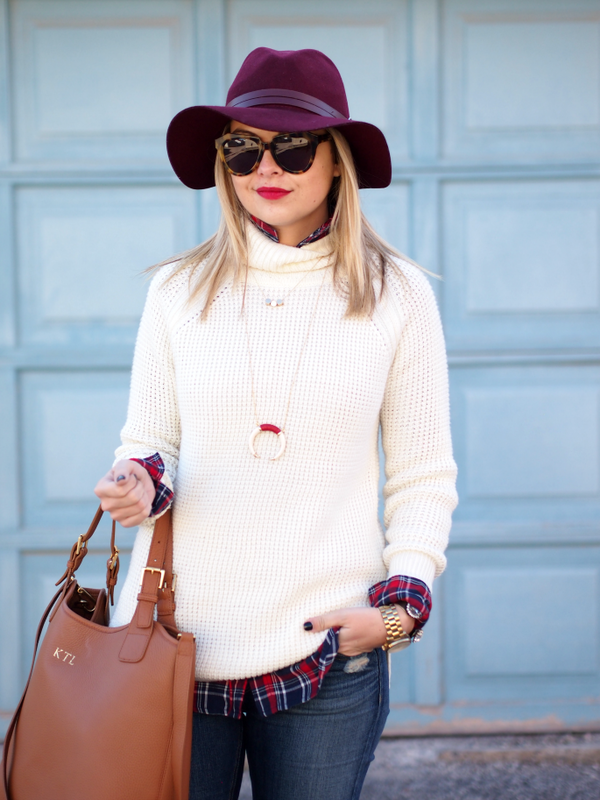 I love the peak of plaid we get under the cozy sweater! I looove this kind of turtleneck outfits! you look great! so chic! Great layering...love the color combo! 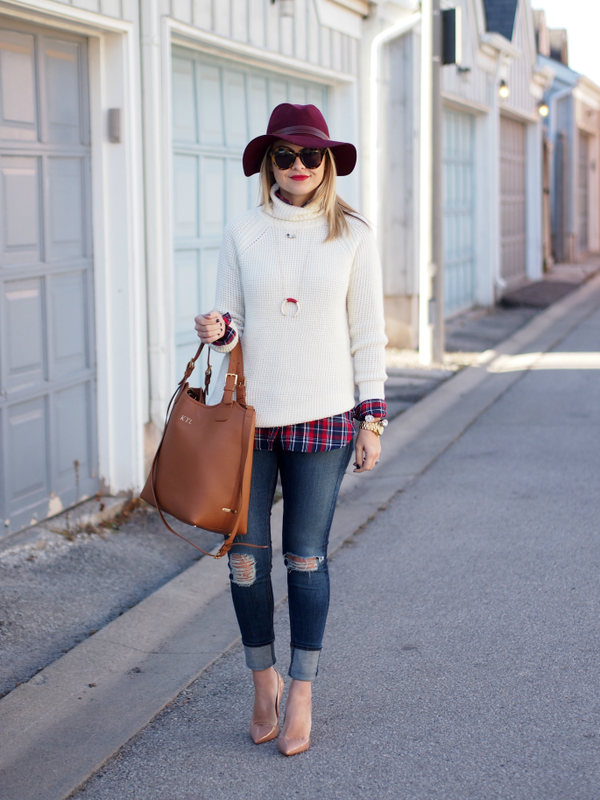 Love this layering and that sweater is such a fab staple! This is a great look! That sweater does look extremely cozy. I liked the burgundy tones paired with the more neutral colors. Super fly! Love the white sweater! Love this classy casual chic look! Especially love the inverted curved pendant, such a cool design and the colors match so perfectly with the outfit, awesome! Gorgeous! also love love the horn necklace. Beautiful piece!